Informal group portrait of soldiers returning to Australia on HMAT Medic. 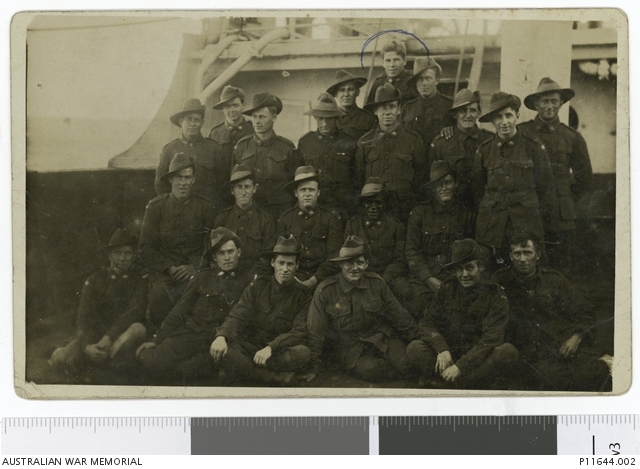 Identified are 3718 Private (Pte) Frank Leslie Corpe (at the back, circled) and 6020 Pte Douglas Grant, an indigenous soldier (second row, seated fourth from the left). Both men served with the 13th Battalion and along with other members of the battalion were taken prisoner of war (POW) on 11 April 1917 at Riencourt, Germany. This group probably includes fellow 13th Battalion POWs who returned on the Medic with Privates Corpe and Grant. This image is from the collection of Frank Corpe.